The CareGiver Partnership: How to Prepare for a Parents Death. New Book, New Tips. How to Prepare for a Parents Death. New Book, New Tips. By Tom Wilson, Co-Founder and President of The CareGiver Partnership. Today I have the great pleasure of being the host on Day 8 of the Virtual Blog Tour of author Carolyn A. Brent whose book Why Wait? 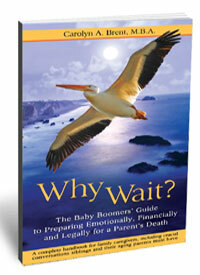 The Baby Boomers' Guide to Preparing Emotionally, Financially and Legally for a Parent’s Death launches on Amazon on Tuesday November 15, 2011. Author Carolyn A. Brent, M.B.A. is a former clinical educational manager in the pharmaceutical industry. She is an avid activist and advocate working with the U.S. Congress for the purpose of creating change to protect seniors and veterans from financial and medical abuse. She has appeared on many local and national TV and radio shows, and is a sought-after keynote speaker. Yesterday, Carolyn visited Paula Tarrant at http://inspiredwomenwork.com/how-to-be-a-better-caregiver-for-a-parent/ , where they talked about supporting parents when caregiving and self-care. Today, I'd like to share with you a recent interview I had with Carolyn when I got to ask her some questions on talking with your parents/siblings and elderly nutrition. Tom Wilson: When is the right time to discuss financial issues with your parents? Before or after there is an emergency. Carolyn A. Brent: For the elderly, now is the time for conversations about end-of-life issues to take place with their adult children, not later. And if your parents don’t bring the subject up, as a concerned child you should. I call these conversations “crucial” because the outcome matters. Tom Wilson: If you have siblings, do you do it one on one with your parents or first talk with your siblings? Carolyn A. Brent: Make Caregiving a Family Affair…. It is in the best interest of siblings to pull together as a team when there’s a need to care for a chronically ill or dying parent. How different family members step in at such a time to offer assistance to the parent depends on the relationship dynamics of the family. Ultimately your role in your parent’s care depends on many factors, not the least of which is your willingness to be involved, and whether or not your parent is competent to make decisions and desires your participation. Tom Wilson: There are 6 million seniors who are malnourished in the U.S. I've heard stories of seniors ordering pizza delivery every day, because they can't get out or up and around to cook. What do you suggest? Carolyn A. Brent: The following are wonderful resources I have found that are very helpful regarding feeding seniors and helping them to get nutritious foods. The name of the federal program was changed to SNAP as of Oct 1, 2008; individual states may help the program under a different name. When you visit the page at the link above and request a "launch reminder", you will automatically receive a FREE pass to Carolyn's 3-day "Why Wait? Telesummit", with a panel leading experts preparing emotionally, financially and legally for the death of a parent. You can listen to the telesummit online in the comfort of your own home, and even ask questions during the broadcast. When you buy Carolyn's book on Tuesday November 15, 2011, you can ALSO receive a complete library of beautiful personal development gifts from authors, speakers, coaches and other enlightened professionals from around the globe.